If you have a heart for exceptional students and the drive to help them succeed, then you should consider an online Master’s in Special Education online. Approximately 440,000 SPED teachers currently lead classrooms in America, with thousands of other online master’s in special education program graduates working in related roles. The Bureau of Labor Statistics (BLS) projects that the need for special education teachers will grow 8% by 2026, which equates to more than 33,000 teachers. With expanded access in meaningful assistive technology to help learners achieve their dreams, now is a great time to pursue a career in this field. If your passion lies in education, read on to learn about the opportunities awaiting you at the end of an online master’s in special education degree. What Else Can I Expect From an Online Master’s in Special Education Program? What Are the Best Online Master’s in Special Education Programs? University of Florida ranks #1 on The 30 Best Online Master’s in Special Education Degree Programs! Based in Gainesville, the University of Florida enrolls approximately 12,000 graduate students annually, many of whom pursue their degrees remotely. UF offers more than 100 distance education opportunities, including its online master of education in special education, which is referred to as the Teach Well program. Designed for experienced educators, this option provides a research-based curriculum that prepares teachers to serve learners with special needs in an inclusive classroom setting. The 36-credit degree plan includes core classes in teaching learning strategies, collaborative school practices, and families and transition for students with disabilities. UF stands out among other online master’s in special education programs by offering degree candidates five focus areas in autism, early childhood studies, disabilities in society, dyslexia, and a generalist track. The Teach Well program facilitates part-time enrollment, where students take two classes every fall, spring, and summer semesters. Participants typically earn their master’s in two years. Online coursework is asynchronous and delivered through the Canvas learning management system. This fully remote program has no campus residency or thesis requirements. UF accepts applications on a rolling basis. To be eligible, candidates must submit GRE verbal and quantitative scores of at least 147. UF offers online learning to all U.S. residents, except individuals living in California. The University of Florida is regionally accredited by the Southern Association of Colleges and Schools Commission on Colleges (SACSCOC). Distance education at UF is recognized by the National Council for State Authorization Reciprocity Agreements (NC-SARA). North Carolina State University ranks #2 on The 30 Best Online Master’s in Special Education Degree Programs! Established in 1889 as a technical school for the agricultural and mechanical arts, North Carolina State University now stands as a comprehensive institution, offering over 80 distance education programs. These options include an online master of arts in teaching in special education for individuals who hold a bachelor’s degree but not a valid NC teaching license. Through a curriculum that emphasizes cultural diversity and technology in the classroom, prospective teachers learn to integrate theory into practice to support young learners with learning disabilities and other special needs. This program uses a hybrid format that combines online classes (both asynchronous and synchronous) delivered through the WolfWare platform with hands-on practicum experiences in the form of internships and student teaching hours. Totaling 33 credits, this online special education master’s degree plan consists of courses like resource teaching in special education, instructional strategies for students with disabilities, and organization and behavioral management for inclusive classrooms. This degree has no thesis requirements; instead, students must pass a series of cumulative exams. Degree candidates must receive acceptable marks on the edTPA assessment protocol and the NCDPI General Curriculum and NC Foundations of Reading tests in order to earn their master’s degree and initial teaching license. Admission requirements include a regionally accredited bachelor’s degree earned with a minimum 3.0 GPA. Candidates must also submit their GRE scores. NCSU has application deadlines on the first of June, November, and April. Online learners pay the same tuition, regardless of where they live. North Carolina State University is regionally accredited by the Southern Association of Colleges and Schools Commission on Colleges (SACSCOC). Purdue University ranks #3 on The 30 Best Online Master’s in Special Education Degree Programs! Located in West Lafayette, Indiana, Purdue University offers 22 distance education programs to graduate students, including an online master of science in education in special education. This MSEd program trains new and experienced teachers to meet the needs of learners with exceptionalities using evidence-based practices for curricula design, classroom instruction, and student evaluation. The program uses flexible, asynchronous courses delivered by Blackboard. Participants also engage in hands-on skill development through a perfunctory 7-8-week practicum and, depending on what degree track they choose, a 16-week student teaching placement. These experiences can be completed in the candidate’s community under electronic supervision from faculty and program administrators. Unlike more limited special education master’s programs, online students at Purdue can pick from one of six program tracks. Individuals can pursue a 31-credit, degree-only plan and finish in as few as 20 months. Alternatively, they can opt to take on additional coursework and experiential learning requirements to earn their initial teaching license and additional licensure in mild intervention and/or intense intervention. Regardless of their track, all program candidates complete core classes that include advanced assistive technology, applied behavior analysis for teachers, and characteristics of children with disabilities. The curriculum aligns with state and national standards for teacher preparation, and degree candidates stand ready to take edTPA exams. To apply, prospective students must hold a regionally accredited bachelor’s degree and submit their GRE scores. Those with a 3.0 GPA or higher may be exempted from standardized test requirements. University of Nebraska - Lincoln ranks #4 on The 30 Best Online Master’s in Special Education Degree Programs! The University of Nebraska-Lincoln was chartered in 1869 as a land grant school. Today, the university stands as one of the state’s main hubs of higher education and professional development. UNL hosts over 25 distance education programs for graduate students, including online master of arts and master of education programs in special education. These offerings prepare teachers to engage and support learners with exceptionalities through differentiated instructional strategies and skills assessments that account for diverse learning styles and cultural backgrounds. UNL’s master’s degree in special education online programs accept applications for summer and fall entry. All special education graduate students take the same core classes, which include collaborative teaching practices, law and ethical issues, and classroom management. Degree candidates pursuing the 36-credit MEd track take additional coursework in one or two minors. With no thesis requirements, this option suits experienced teachers who want to add special education endorsements. Alternatively, MA students choose from thesis or non-thesis tracks and have the option of pursuing minor topics or taking all of their advanced classes within the major. All degree candidates must complete an oral or written comprehensive exam. Application materials include a regionally accredited bachelor’s degree, GRE scores, a professional resume or CV, and three references. Candidates must also complete certain prerequisite courses to be eligible for admission. George Washington University, GW Online ranks #5 on The 30 Best Online Master’s in Special Education Degree Programs! Based in the District of Columbia, George Washington University operates a robust distance education platform that contains hundreds of open courses and more than 40 graduate degree programs. These opportunities include its online master of arts in secondary special education and transition services. This 33-credit hybrid program enables students to earn both initial teacher licensure and a graduate degree. Faculty emphasize social justice issues and legislative requirements, preparing degree candidates for leadership roles in classrooms and to work in transition programs that provide employment and independent adulthood guidance to individuals with exceptionalities. The curriculum consists of classes that include developmental assessment of adolescents; curriculum and instructional methods; and issues in educating individuals with learning, emotional, and intellectual disabilities. In addition to asynchronous courses facilitated by Blackboard, the program features practicum and internship requirements, which students can complete with a university partner or at an approved organization in their community. Degree candidates who want to earn their teaching license must also complete student teaching hours. Most participants finish the program in 2-3 years. Program entry occurs in the summer semester. To be eligible for this online MA program, candidates must hold a regionally accredited bachelor’s degree and submit GRE or GMAT scores. Distance learners pay the same tuition, regardless of where they live. George Washington University is regionally accredited by the Middle States Commission on Higher Education (MSCHE). The online master’s in special education program is fully accredited by the Council for the Accreditation of Educator Preparation (CAEP). Pennsylvania State University ranks #6 on The 30 Best Online Master’s in Special Education Degree Programs! Pennsylvania State University offers more than 150 academic programs to distance learners through its World Campus, including graduate opportunities like an online master of education in special education. This program is ideal for professionals with previous education or human services experience who want to advance their careers. Degree candidates can take courses full-time and graduate in one year, or they may pursue part-time enrollment (by taking two courses each semester) and earn their master’s in two years. The degree plan totals 32-33 credits and includes core classes in special education research and teaching learners with disabilities in inclusive settings. Participants complete the remaining credit requirements in one of three emphasis areas: autism, academic and behavior supports, or applied behavior analysis (ABA). The ABA course sequence aligns with Board Certified Behavior Analyst (BCBA) standards and prepares students for the organization’s professional exams. Certified BCBAs develop, actualize, and evaluate programs that promote positive behavior in individuals with special needs. All degree candidates, regardless of their emphasis area, also complete a capstone seminar. Penn State’s online master’s degree in special education program does not lead to initial teaching licensure but may fulfill renewal requirements. The school enrolls students in the fall, spring, and summer. Applicants must possess a regionally accredited bachelor’s degree earned with a minimum 3.0 GPA, but the program does not require applicants to submit standardized test scores. Distance learners may pay tuition on a per-credit basis or as a flat, full-time enrollment package. University of Missouri ranks #7 on The 30 Best Online Master’s in Special Education Degree Programs! Located in the city of Columbia, the University of Missouri offers nearly 50 graduate programs for distance learners through its Mizzou Online platform. These opportunities include a master of arts in special education with an emphasis in general special education. This program focuses on research and trains future teacher-leaders to deliver behavioral intervention and multifaceted systems of support to students with disabilities and exceptionalities. In addition to positions in the classroom, Mizzou graduates go on to work as child psychologists, interventionists, and program administrators. Unlike some online master’s programs in special education, the Mizzou track contains no campus-based residencies. Degree candidates take 33 credits in courses such as research with exceptional children, cross categorical special education, and advanced behavior management: applied behavior analysis. The degree plan also provides personalization options in the form of six elective credits. Students round out their graduate studies by completing a comprehensive take-home exam. Additionally, with the guidance of a faculty advisor, participants complete either a thesis or capstone project that addresses a challenge in the special education field. This program admits students in the fall, spring, and summer terms, with application deadlines on July 15th, October 1st, and March 1st, respectively. Admission requirements include a regionally accredited bachelor’s degree earned with a minimum 3.0 GPA and GRE scores. All distance learners pay the same tuition. The University of Missouri-Columbia is regionally accredited by the Higher Learning Commission (HLC). Programs offered through the school’s college of education receive specialized accreditation from the Teacher Education Accreditation Council (TEAC). University of Arkansas Global Campus ranks #8 on The 30 Best Online Master’s in Special Education Degree Programs! Established in 1871 and located in the city of Fayetteville, the University of Arkansas offers 81 graduate programs, including several distance education pathways like its online master of education in special education. Designed for professionals with active teaching licenses, this program prepares graduates for leadership roles in the development and implementation of educational and transitional services for individuals with disabilities. Faculty deliver asynchronous coursework through Blackboard Learn, and most participants earn their degree in fewer than two years. Totaling 36 credits, the curriculum includes required classes in life-span human development, historical foundations of modern education, and psychological concepts of teaching and learning. In addition to earning a master’s degree, candidates may add graduate certificates in applied behavior analysis and autism spectrum disorders, as well as specialty endorsements in dyslexia therapy and educational examiner. These additions require advanced coursework, practicum experiences, and relevant testing that may lengthen the program’s overall time frame. Prospective students may apply for admission in the spring, summer, or fall semesters, with application deadlines of December 1st, April 15th, and August 1st, respectively. To be eligible, candidates must hold a bachelor’s degree earned with a minimum 3.0 GPA and submit adequate GRE scores (i.e., at least 49th percentile for verbal and quantitative reasoning and 54th percentile for analytical writing). The University of Arkansas is regionally accredited by the Higher Learning Commission (HLC). 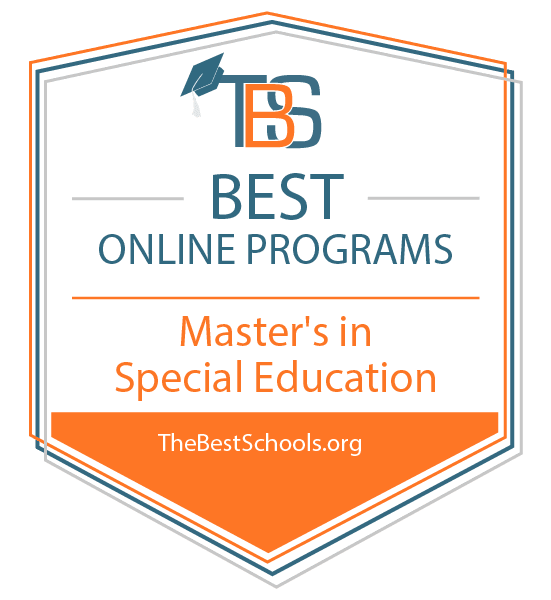 The master’s in special education online program is accredited by the National Council for Accreditation of Teacher Education (NCATE) and recognized by the Council for Exceptional Children (CEC). The University of Alabama ranks #9 on The 30 Best Online Master’s in Special Education Degree Programs! Founded in 1818, the University of Alabama stands as the state’s oldest institution of higher education. Today, the school provides more than 60 distance education programs through its Bama By Distance platform, including master of arts and alternative master of arts degrees in special education. By studying contemporary research on behavioral development and inclusion, as well as evidence-based classroom and transition strategies, participants gain the skills needed to serve secondary school students with disabilities. These online master’s in special education programs use a blended/hybrid learning structure that combines asynchronous classes powered by Blackboard with flexible night and weekend classes. The MA in special education suits teachers with active licenses who want to earn advanced Alabama Class A certification in collaborative 6-12. Students who pursue this track take 36 credits of coursework and graduate in approximately two years. The alternative MA program is designed for students with no background in teaching or education. This 45-48-credit curriculum includes classes like computer-based instructional strategies, introduction to mild and severe disabilities, and teacher consultant models in special education. Degree candidates complete an internship under the tutelage of a certified teacher during their last semester, and graduates earn their initial teaching certification in addition to their master’s degree. All distance learners pay the same tuition. Application materials for both programs include a bachelor’s degree. Candidates must hold a minimum 3.0 GPA and submit GRE scores of at least 300 or MAT scores in the 50th percentile. The University of Alabama is regionally accredited by the Southern Association of Colleges and Schools Commission on Colleges (SACSCOC). The school’s education programs hold specialized accreditation from the National Council for Accreditation of Teacher Education (NCATE). Rowan University ranks #10 on The 30 Best Online Master’s in Special Education Degree Programs! Based in Glassboro, New Jersey, Rowan University was founded in 1923 as a small teacher preparation college. The school has since grown into a comprehensive institution that enrolls over 14,000 students every year. Staying true to its roots, Rowan offers accessible graduate degrees to certified teachers, including three online master of arts in special education options. In addition to earning their master’s degree, candidates may pick from a graduate endorsement, autism spectrum disorders track, or learning disabilities track. The curricula range from 30-36 credits, and most students graduate after 5-7 consecutive semesters of study. Regardless of their specific degree plan, all students take core classes in educational assessment, research, and administration and supervision in special education. Those who want to add a graduate-level endorsement to their initial teaching license pursue advanced topics in classroom strategies and related practicums. Teachers who already hold special education credentials can add specialized training in applied behavior analysis to assist learners on the autism spectrum. Alternatively, they can enroll in the learning disabilities track, which trains them to be teacher-leaders in their classrooms, schools, and communities. Rowan admits students in the fall, spring, and summer semesters, with application deadlines on the first of July, November, and April, respectively. Applicants need not submit GRE scores, but they should possess a bachelor’s degree earned with a minimum 2.75 GPA. All distance learners pay the same per-credit tuition. Rowan University is regionally accredited by the Middle States Commission on Higher Education (MSCHE). Texas Tech University ranks among The 30 Best Online Master’s in Special Education Degree Programs! Texas Tech University enrolls nearly 6,000 students in its 100 graduate degree programs every year, including many distance education options such as eight tracks in its online master of education in special education program. In addition to a generic special education track, students can pursue specialized degree plans in autism, applied behavior analysis, deaf education, educational diagnostician, orientation and mobility, transition, and visual impairment. These options enable new and experienced educators to pursue the training needed for career entry and advancement. Participants complete asynchronous coursework online through the Blackboard learning management system. Some program tracks require weekend classes and summer residencies on campus. All of the school’s online special education master’s programs consist of core classes in research methods, human development in education, and exceptional children and youth. Degree candidates go on to take advanced coursework in their specialization, which may include internships, other practicum requirements, or thesis projects. Those who pursue the applied behavior analysis, educational diagnostician, and orientation and mobility tracks prepare for national certification exams as part of the curricula. The program accepts applications for the fall and spring semesters. Admission requirements include an accredited bachelor’s degree, although minimum GPA standards vary depending on the program. The school encourages graduate candidates to submit GRE scores, but this is not mandatory. Certain tracks require students to hold an active initial teaching certificate and/or at least two years of relevant work experience. University of Cincinnati ranks among The 30 Best Online Master’s in Special Education Degree Programs! Founded in 1819, the University of Cincinnati boasts an annual student enrollment that exceeds 44,000, making it one of the largest institutions of higher education in Ohio. UC also offers a comprehensive catalog of distance education programs, including graduate pathways like its online master of education in special education. Through an integrative curriculum, participants learn to assist and enhance the lives of individuals with disabilities through education, community engagement, and inclusive service delivery. The program is entirely remote, with no required campus visits, and most students earn their degree in fewer than two years. UC graduates go on to become teacher-leaders in K-12 education, private consultants, disability advocates, and adult occupational rehabilitators. Fourteen-week courses use an asynchronous format delivered through Blackboard. Degree candidates take 33 credits in classes that include applied behavior analysis, autism spectrum disorders, and transition strategies for individuals with disabilities. Students also train in advanced research methods, which they apply in a culminating master’s project that includes data aggregation and analysis as well as a substantive literature review. This program admits students in the fall and spring semesters. To apply, candidates must hold a regionally accredited bachelor’s degree earned with a minimum 3.0 GPA and submit GRE or GMAT scores. The University of Cincinnati is regionally accredited by the Higher Learning Commission (HLC). The online master’s in special education program receives specialized accreditation from the Council for the Accreditation of Educator Preparation (CAEP). Michigan State University ranks among The 30 Best Online Master’s in Special Education Degree Programs! Based in East Lansing, Michigan State University was established in 1855 as an agricultural college. Today, MSU stands as a comprehensive degree-granting institution that offers more than 50 distance education options, including an online master of arts in special education. This program prepares active K-12 teachers for leadership roles inside and outside of the classroom through a curriculum that combines research-based strategies with practical applications. Faculty deliver coursework asynchronously through the Desire2Learn platform, and most students graduate in two years. The 33-credit degree plan consists of core coursework in collaboration and consultation in special education, assessment of students with mild disabilities, and behavior management in the inclusive classroom. Students pursue advanced topics in one of two emphasis areas: autism spectrum disorders or learning disabilities. To add these endorsements to their initial teaching license, degree candidates must complete 90 to 240 hours of guided practice. Students carry out these experiences at an organization in their community. MSU also offers a six-course add-on option that results in a graduate certificate in applied behavior analysis. MSU’s online special education master’s program only accepts admission for the summer semester, with an application deadline on the first of February. To apply, candidates submit baccalaureate credentials, three recommendation letters, a professional resume/CV, a personal statement, and a valid teaching certificate. Due to the university’s online accreditation process, Maryland and Arkansas residents cannot enroll in this program. University of Oklahoma - Norman ranks among The 30 Best Online Master’s in Special Education Degree Programs! The University of Oklahoma is one of the state’s premier public research and academic institutions. OU enrolls over 6,000 graduate students, many of whom pursue distance education opportunities like the school’s online master of education in special education. This program blends theoretical study with research and applied practice, preparing students to serve the diverse needs of individuals with disabilities. Graduates work as classroom teachers, behavior analysis, special education administrators, and transition specialists. OU’s online master’s degree in special education totals 33 credits and consists of required topics like advanced assessment, contemporary issues and research, and instructional methods and programming. Degree candidates complete advanced coursework in their specializations, choosing from a generalist track, secondary transition education, or applied behavior analysis. Participants who do not hold a teaching license can pursue the non-traditional route to certification, which includes an intensive 150-hour student teaching “boot camp.” All students may take on a thesis project as part of their degree plan. Distance learners can choose an entirely online learning experience, where they complete synchronous coursework facilitated by Canvas, or they can opt for a hybrid format that combines online sessions with flexible face-to-face classes on the Norman campus. Prospective students may submit applications on a rolling basis for the fall, spring, or summer semesters. Eligibility requirements include a bachelor’s degree earned with a minimum 3.0 GPA; however, this program does not require standardized test scores. Students can apply for financial aid, including the Transition Education Scholar Fellowships and other program-specific awards. University of South Florida ranks among The 30 Best Online Master’s in Special Education Degree Programs! Located in Tampa, the University of South Florida serves over 50,000 students every year through 235 academic programs. This comprehensive catalog includes many distance education opportunities, such as the school’s online master of arts in special education with specializations in exceptional student education, behavior disorders, learning disabilities, and intellectual disabilities. Designed for professionals with experience in special education or a closely related field, this program prepares students to assist individuals with exceptionalities in a variety of positions, from classroom instruction and school administration to community advocacy and transition program services. The degree plan ranges from 30-36 credits and includes required coursework in areas like advanced psychoeducational assessment, instructional approaches for exceptional populations, and working with families: a pluralistic perspective. Students who pursue the exceptional student education track take three advanced theories courses, while those who choose the other tracks take a theories class relevant to their specialization and two electives By choosing appropriate electives, these students can fulfill requirements for advanced endorsement in autism, reading, gifted education, or severe and profound disabilities. All master’s in special education online students must also complete independent research and practicum experiences, the latter of which can be done with a current employer or at an organization in their community. Application requirements include a regionally accredited bachelor’s degree earned with a minimum 3.0 GPA and GRE scores of at least 154, 143, and 4.5 in the verbal reasoning, quantitative reasoning, and analytical writing sections, respectively. Those who transfer in with at least nine credits of special education graduate coursework may apply for standardized test exemption. Florida International University ranks among The 30 Best Online Master’s in Special Education Degree Programs! Florida International University offers more than 196 academic programs, including distance education options such as its online master of science in special education. Emphasizing classroom-based research and practice, this program trains students to deliver instruction and support services to culturally and linguistically diverse children with special needs. Graduates earn a master’s degree and Florida Autism Endorsement. The program is available entirely online, with asynchronous courses powered by Canvas. Full-time students can earn their degree in 12 months and begin taking classes in the fall or summer. The 36-credit degree plan includes coursework in instructional technology, nature and needs of students with autism spectrum disorders, and working with families using collaborative approaches. In addition to class discussion and assignments, students engage in an action project at an approved K-12 academic environment in their community. The project spans the entirety of the program, enabling participants to conduct research and gain hands-on practice under the guidance of a faculty adviser and site coordinator. To be eligible for this online special education master’s program, prospective students must hold a bachelor’s degree earned with a minimum 3.0 GPA. Those who do not meet this threshold may apply for conditional enrollment. Candidates must also possess a valid teaching certificate and have access to a K-12 educational setting throughout their enrollment in this program. However, students need not submit their GRE scores. Regardless of their residency status, all distance learners pay the same tuition rate. FIU offers financial aid to qualifying distance learners, including its Online Academic Merit Scholarship and other institutional awards. Florida International University is regionally accredited by the Southern Association of Colleges and Schools Commission on Colleges (SACSCOC). University of Idaho ranks among The 30 Best Online Master’s in Special Education Degree Programs! Located in the city of Moscow, the University of Idaho enrolls more than 12,000 students annually, many of whom pursue degrees remotely. Among these distance education opportunities is the school’s online master of education in special education, which is an entirely remote program for new and experienced teachers. This program provides participants with a theoretical understanding of diverse disabilities, helpful instructional strategies, and hands-on training in the classroom. Degree candidates take required courses that include behavioral analysis for children and youth, educating for exceptionalities, and language development and communication disorders. U of I allows students to pursue one of four program tracks. Certified teachers can pursue degree-only, certificate-only, or special endorsement tracks, performing independent research and pursuing professional development opportunities that suit their career goals. Learners with no teaching experience can earn both their master’s and initial teaching certificate in special education simultaneously; however, this track takes longer than the standard 12 months and culminates with a full semester of student teaching. Program candidates must hold a regionally accredited bachelor’s degree earned with a minimum 3.0 GPA. Applicants with a GPA below this threshold may be accepted if they possess at least five years of relevant work experience. Online coursework is facilitated by Blackboard and combines live and asynchronous learning elements. The University of Idaho is regionally accredited by the Northwest Commission on Colleges and Universities (NWCCU). The online master’s in special education program receives specialized accreditation from the Council for the Accreditation of Educator Preparation (CAEP). University of North Dakota ranks among The 30 Best Online Master’s in Special Education Degree Programs! The University of North Dakota opened its doors in 1883 — six years before the state was founded — to a class of just eight students. Today, UND offers over 200 academic programs, including accessible distance education pathways like its online master of education and master of science in special education programs. These comprehensive offerings train graduates to diagnose exceptionalities and difficulties as well as develop curricular and transitional approaches to help individuals with special needs. These degree tracks feature completely remote courses, and participants can earn their master’s degree in as few as 18 months. All coursework is asynchronous and delivered through Blackboard. In addition to core classes in assessment, behavior analysis, and research methods, students pursue advanced topics, practicum/internship experiences, and/or a thesis depending on their specialization. Participants choose from one of 10 options, including early childhood special education, gifted/talented, intellectual disabilities, autistic spectrum disorders, and visual impairment. Curricula consist of at least 32 credits, but individuals seeking certification and/or endorsement on top of their master’s diploma may need to take more classes. Prospective students can apply for fall, spring, or summer admission with application deadlines on the 15th of June, October, and March, respectively. Applicants should hold a bachelor’s degree earned with a minimum 3.0 GPA, but students need not submit GRE scores. All distance learners pay the same tuition and can apply for financial assistance, including the Ben & Ruth Gustafson Continuing Education Endowment Scholarship, which is offered specifically to nontraditional students. The University of North Dakota is regionally accredited by the Higher Learning Commission (HLC). The master’s in special education online program is fully accredited by the Council for the Accreditation of Educator Preparation (CAEP). Virginia Commonwealth University ranks among The 30 Best Online Master’s in Special Education Degree Programs! Located in Richmond, Virginia Commonwealth University serves over 5,000 graduate students every year through campus-based and distance education programs. Distance opportunities include the school’s online master of education in special education with a concentration in general education. This program provides participants with the research, consultative, and curricular design skills necessary to aid learners with special needs in a variety of transitional settings, from secondary school to independent adult living. VCU welcomes students of diverse backgrounds. Enrollees who already hold an initial teaching license may pursue advanced endorsement in special education general curriculum, while individuals who do not have a license may seek alternative certification through the Richmond Teacher Residency Program or the Certifying Online Virginia Educators Program. The 37-credit degree plan includes core classes in behavior analysis and motivation, inclusive classroom management, and reading and language instruction for learners with special needs. Participants must also complete practicum experiences, including student teaching hours and/or internships. In addition to baccalaureate credentials, applicants must submit GRE/MAT scores of at least 290/386. Application deadlines for the fall and summer semesters fall on the first of February and November, respectively. Because of online accreditation standards, VCU cannot offer distance education to residents of California, Massachusetts, or Puerto Rico. Virginia Commonwealth University is regionally accredited by the Southern Association of Colleges and Schools Commission on Colleges (SACSCOC). The master’s in special education online program is fully accredited by the National Council for Accreditation of Teacher Education (NCATE) and the Council for Exceptional Children (CEC). University of North Carolina at Charlotte ranks among The 30 Best Online Master’s in Special Education Degree Programs! The University of North Carolina at Charlotte offers 64 graduate degree programs, including an online master of education in special education (academically or intellectually gifted) and an online master of arts in teaching in special education (K-12). The school designed its MEd and MAT programs for educators who hold an initial teaching license. Both of UNC Charlotte’s online special education master’s programs prepare graduates to support the diverse needs of individuals with disabilities and exceptionalities. UNC Charlotte delivers asynchronous online courses through the Canvas learning management system. Program length varies based on a student’s personalized degree plan, but most participants earn their master’s degree in two years. The MEd curriculum totals 33 credits and includes courses like theory and development of creativity, social and emotional needs of gifted students, and adapting curriculum materials and classroom differentiation. Degree candidates also conduct research and complete a culminating project and presentation. Admission into this track requires a regionally accredited bachelor’s degree earned with a minimum 3.0 GPA and GRE/MAT scores in the 30th percentile. Alternatively, the 39-credit MAT degree plan consists of required classes in single case research, advanced classroom management, and a capstone seminar in professional and leadership development. This program features a practicum, and applicants with access to full-time classroom teaching opportunities receive preference. Admission requirements include completion of the UNC Charlotte Graduate Certificate in Teaching Special Education Adapted or General Curriculum program with a minimum 3.5 GPA. Program candidates must also submit GRE or MAT scores. West Chester University of Pennsylvania ranks among The 30 Best Online Master’s in Special Education Degree Programs! West Chester University of Pennsylvania was founded in 1871 as an institution for teacher preparation. The school continues to offer accessible education degrees to this day, including remote opportunities like its online master of education in special education. This program highlights self reflection and collaboration as the cornerstones of effective classroom pedagogy, transition programs, and other support systems for individuals with special needs. Full-time students can complete the program in two years. Faculty deliver online courses asynchronously through the Desire2Learn platform. The 33-credit degree plan contains required courses in behavior management, legal issues in special education, and family and community systems. Students also train in advanced action research methods and round out their studies with a final project. Learners can specialize in autism spectrum disorders or universal design for learning and assistive technologies. Although the program does not automatically lead to teaching licensure, students may opt to enroll in a dual degree and certificate track that includes intensive student teaching hours during the second summer session. Alternatively, participants may apply this coursework to an external educator preparation program. This program uses a rolling admissions schedule. To apply, candidates must submit baccalaureate credentials earned with a minimum 3.0 GPA and GRE or MAT scores in the 50th percentile. West Chester University of Pennsylvania is regionally accredited by the Middle States Commission on Higher Education (MSCHE). The master’s in special education online program receives specialized accreditation from the National Council for Accreditation of Teacher Education (NCATE). Ball State University ranks among The 30 Best Online Master’s in Special Education Degree Programs! Located in Muncie, Indiana, Ball State University offers 99 graduate degree programs, including distance education pathways like its online master of arts in special education. This program welcomes all students, including those without any teaching or education-related experience. Facilitated by Blackboard, faculty deliver most courses asynchronously. The majority of enrollees earn their master’s degree in two years. Outside of core research classes, students customize a 30-credit degree plan to fit their academic interests and career goals. Ball State offers degree candidates eight specialization options. Students may add on graduate-level certificates in applied behavior analysis, autism, response to intervention, emotional and behavioral disorders, or disabilities for post-secondary settings with an emphasis in autism. Alternatively, participants can opt for a license-based specialization, including administrative director of special needs or teaching tracks in mild interventions, severe interventions, or early childhood special education. Each specialization comes with distinct course, practicum, and capstone requirements. Ball State offers admission in the fall, spring, and summer semesters with application deadlines on July 10th, November 15th, and April 15th, respectively. To apply to this online master’s in special education program, candidates must hold a regionally accredited bachelor’s degree earned with a minimum 2.75 GPA. However, students need not submit their GRE scores. Distance learners also enjoy access to library services, writing center assistance, subject tutoring, and around-the-clock technology support. University of Memphis - UM Online ranks among The 30 Best Online Master’s in Special Education Degree Programs! The University of Memphis offers over 60 distance education programs, including an online master of arts in teaching special education. This option synthesizes fundamental strategies in general instruction with behavior management and inclusive classroom practices that engage learners with disabilities. The curriculum trains students to occupy roles as teacher-leaders, para-educators, program managers, and special education consultants. Faculty deliver online courses using the Blackboard learning management system, and degree candidates can complete the program in two years. In addition to a degree, this online special education master’s program leads to initial teaching certification in modified special education; this program is ideal for those who want to work with children with mild disabilities and developmental delays. The curriculum requires learners to complete at least 30 credits in courses such as psychoeducational assessment, child psychology applications for teachers, and language and communication in an inclusive classroom. Additional program requirements include a practicum and student teaching hours. Prospective students may apply for admission in the fall or spring, with application deadlines on September 15th and January 31st, respectively. Candidates must possess a bachelor’s degree earned with a minimum 3.0 GPA. To be eligible for the teacher preparation program, applicants must submit scores for the CORE Academic Skills for Educators: Writing and the Praxis II Content Knowledge Exam. These CORE requirements may be waived if candidates send in adequate GRE scores (i.e., verbal 143, quantitative 138, and writing 3.5). George Mason University ranks among The 30 Best Online Master’s in Special Education Degree Programs! Based in Fairfax, Virginia, George Mason University enrolls over 34,000 students annually. Many of these learners pursue degrees remotely in programs like the school’s online master of education in special education. Designed for either experienced teachers or new professionals, this MEd prepares participants to meet the diverse and long-term needs of individuals with special needs and exceptionalities. The integrative curriculum combines theoretical concepts with practical input from experienced teachers, specialists, and community leaders. All coursework, both synchronous and asynchronous, can be completed online through Blackboard. Learners do not have any residency or practicum requirements, and participants can earn their master’s degree in two years by taking classes part-time. Totaling 30 credits, the degree plan consists of required classes like special education research, universal design for learning, and computer applications for special populations. Students enrolled in this online master’s in special education program also investigate advanced topics to earn a certificate in either autism spectrum disorders or applied behavior analysis. Participants round out their studies with a research application project that demonstrates their expertise of key skills and concepts. The program accepts applications on a rolling basis. Candidates must possess a bachelor’s degree earned with a GPA of 3.0 or higher. Although the program does not require standardized test scores, applicants can use their GRE or MAT scores to make up for an inadequate GPA. Distance learners pay the same tuition, regardless of where they live. George Mason accepts transfer credits from regionally accredited institutions on a case-by-case basis. George Mason University is regionally accredited by the Southern Association of Colleges and Schools Commission on Colleges (SACSCOC). Quinnipiac University ranks among The 30 Best Online Master’s in Special Education Degree Programs! Quinnipiac University, located in Hamden, Connecticut, hosts more than 33 graduate degree programs, including distance education opportunities like its online master of science in special education. This MS benefits both licensed teachers looking for an endorsement and non-certified education professionals interested in career advancement. By emphasizing special education law and program design, the program trains students to create inclusive and cooperative academic environments for learners with special needs and their non-disabled peers. This online special education master’s program offers a degree-only track and a cross endorsement option. The former totals 30 credits, while the latter consists of 36 credits. Both degree plans include required coursework in topics like autism spectrum disorders; teaching students with intellectual disabilities; and emotional and behavioral disorder identification, management, and assessment. Both tracks also offer further personalization through guided electives. The difference between these two options is the capstone requirements. Degree-only candidates culminate their program experience with a research proposal, project, and presentation, whereas cross endorsement students complete a six-credit practicum where they work with special needs learners in a professional and supervised educational setting. Online coursework is powered by Blackboard. Application materials include a letter of intent, resume, and regionally accredited bachelor’s degree earned with a minimum 2.8 GPA. Candidates do not need to submit standardized test scores. Prospective learners who want to pursue the cross endorsement track must also hold a valid teaching license. Quinnipiac charges all distance learners the same tuition. Quinnipiac University is regionally accredited by the New England Association of Schools and Colleges (NEASC). University of North Texas ranks among The 30 Best Online Master’s in Special Education Degree Programs! Based in Denton, just a short distance north of the Dallas/Fort Worth area, the University of North Texas offers 86 graduate degree and certificate programs. These include many remote options, such as the school’s online master of education in special education with a concentration in autism intervention. This degree pathway trains students about evidence-based practices for classroom instruction and transition services, preparing them to work as teachers, disability specialists, life skills coaches, and case managers for community-based rehabilitation programs. This accelerated 33-credit program contains no campus residencies and can be completed by full-time students in as few as 15 months. Faculty deliver online classes asynchronously through the Canvas learning management system. Course topics include education research and evaluation, teaching students with high functioning autism, and classroom and behavior management strategies. In addition to required coursework, degree candidates who do not meet designated graduate academic standards may need to take additional background/prerequisite classes. Although this program does not result in initial teacher certification, aspiring educators can apply coursework towards Texas licensure through the university’s IMPACT program. This program offers enrollment once a year in the summer. Application materials include accredited baccalaureate credentials, a personal statement, a professional resume, two letters of recommendation, and GRE scores (the university prefers candidates who score in the 50th percentile). All online students pay the same tuition and can apply for financial aid, including a $1,000 departmental scholarship and other awards offered by the college of education. The University of North Texas is regionally accredited by the Southern Association of Colleges and Schools Commission on Colleges (SACSCOC). The online master’s in special education program is fully accredited by the Council for the Accreditation of Educator Preparation (CAEP). Indiana Wesleyan University ranks among The 30 Best Online Master’s in Special Education Degree Programs! Founded in 1920, Indiana Wesleyan University provides learners with educations based in the liberal arts. The university enrolls over 8,000 distance learners in flexible degree programs, including its online master of education with a major in special education. This entirely remote program is designed for active teachers who want to earn graduate credentials as well as those seeking initial teaching certification in special education for students with mild to moderate disabilities. IWU utilizes a cohort style of learning in asynchronous online classes powered by D2L's BrightSpace. Degree candidates can earn their master's degree and teacher license in approximately two years. Totaling 33 credits, the curriculum includes classes like the culturally competent teacher leader, research-based behavior interventions, and collaboration with families and professionals. Certain courses in the degree plan contain embedded clinical experiences, which students complete at an approved site in their community. Degree candidates take one course at a time, and small classes cultivate an intimate academic setting where students and faculty can collaborate more easily. With three admission dates per year, students can begin pursuing this online special education master's at their convenience. Applicants must hold a regionally accredited bachelor's degree earned with a minimum 2.75 GPA. Additionally, candidates must possess a valid (but not necessarily current) state teacher's license and have at least one year (i.e., a minimum of one semester and one day) of teaching experience from an approved and accredited public, private, or parochial P-12 school in the United States or abroad. The school charges all distance learners the same tuition. Indiana Wesleyan University – Marion is regionally accredited by the Higher Learning Commission (HLC). University of Houston ranks among The 30 Best Online Master’s in Special Education Degree Programs! The University of Houston offers more than 105 graduate degrees, including a variety of distance education programs. Among these options is the school’s online master of education in special populations program, which prepares students for leadership roles in the field of special education. The curriculum combines socio-psychological theories with practical strategies for behavior management and inclusive classroom instruction. UH graduates go onto to work as residential facilities coordinators, education advocates, social workers, and special education teachers. Online coursework is facilitated by Blackboard Learn. The 36-credit degree plan includes required classes in psychological measurement in school settings, learning and education sciences, and teaching individuals with disabilities. In addition to core coursework, students take advanced classes in their specialization, which is chosen from one of four areas: gifted and talented, special education, educational diagnostician, and special education leadership. The first two tracks can be completed entirely online, while the latter two use a hybrid format with practicum and residency requirements. All students must pass a written comprehensive test or relevant TExES exam as part of their capstone requirements. Full-time degree candidates can earn their online master’s in special education in fewer than two years by taking at least nine credits each semester. Admission requirements include baccalaureate credentials earned with a minimum 3.0 GPA and GRE scores. Candidates who want to pursue the educational diagnostician specialization must possess a valid Texas Educator’s Certificate. All distance learners pay the same tuition rate. Due to the National Council for State Authorization Reciprocity Agreements (NC-SARA) mandates, UH cannot offer distance education to residents of California, Florida, or Massachusetts. The University of Houston is regionally accredited by the Southern Association of Colleges and Schools Commission on Colleges (SACSCOC). Nova Southeastern University ranks among The 30 Best Online Master’s in Special Education Degree Programs! Located in Fort Lauderdale, Florida, Nova Southeastern University offers more than 50 distance education options to graduate students, including an online master of education in exceptional student education. This program is designed for certified teachers who want to obtain categorical endorsement in addition to a degree, as well as to educational professionals who want to pursue career advancement by engaging in specialized training. Distance learners can complete the program entirely online through asynchronous classes facilitated by Blackboard Learn. Alternatively, participants can opt for a hybrid format by adding flexible evening and weekend courses at one of the many NSU campuses scattered throughout Florida. The degree plan totals 36 credits and includes required classes in educational research for practitioners, educational and psychological assessment of exceptional learners, and special education law. Beyond the core curriculum, students can select advanced electives that match their interests and career goals. Alternatively, they can pick a predesigned course sequence that aligns with national endorsement standards. These specializations include autism, developmental/intellectual disabilities, emotional and behavioral disorders, gifted, learning disabilities, and pre-kindergarten disabilities. All degree candidates round out their studies by creating an applied professional experience portfolio. NSU accepts applications on a rolling basis. To be eligible for the program, candidates must possess a regionally accredited bachelor’s degree earned with a GPA of at least 2.5. However, applicants do not need to submit standardized test scores. The university accepts up to six graduate transfer credits. Distance learners pay the same tuition, regardless of their residency status. Appalachian State University ranks among The 30 Best Online Master’s in Special Education Degree Programs! Based in Boone, North Carolina, Appalachian State University is part of the University of North Carolina System and offers over 150 academic programs. This degree catalog includes distance education options, such as the school’s online master of arts in special education. Through a curriculum that emphasizes research and experiential learning, students learn the instructional and programmatic skills needed to improve the lives of individuals with special needs. The program uses a hybrid learning structure that combines asynchronous online coursework offered through Moodle with flexible weeknight and weekend classes on campus. The 36-credit degree plan includes courses like product of learning, special education law and leadership, and classroom management for effective instruction. Students go on to take two classes related to their concentration, choosing from emotional/behavioral disorders, learning disabilities, or intellectual disabilities. All participants also complete a portfolio and action research project as part of their capstone experience. Although this online master’s in special education program does not lead to initial teaching credentials, the program does pave the way to licensure and endorsement by fulfilling advanced competency requirements mandated by the North Carolina Department of Public Instruction. Admission requirements include a bachelor’s degree earned with a minimum 3.0 GPA, three letters of recommendation, and GRE or MAT scores. Candidates with GPAs below 3.0 but above 2.5 may be admitted if they score in the 25th percentile on a relevant standardized test. Appalachian State University is regionally accredited by the Southern Association of Colleges and Schools Commission on Colleges (SACSCOC). Before diving into any online master’s in special education program, prospective students should examine degree options carefully. Master’s in special education online programs differ from traditional master’s of education degrees. Core classes and topics comprising an online special education master’s program include issues within special education, common types of intellectual and learning disabilities, the use of inclusive teaching strategies, the integration of assistive technologies, and how to assess learners with special needs. This knowledge proves valuable when seeking a job, as SPED teachers differentiate themselves from standard classroom teachers without specialized training. Learners must also consider if they want to concentrate their knowledge further and help themselves stand out from the crowd while enrolled in their program. Common examples of program specializations include applied behavior analysis, special education technology, curriculum and instruction, and autism spectrum disorder. Learners should check with any prospective online master’s in special education programs to learn about specific offerings. A final consideration involves the type of final project that appeals most to learners. While students enrolled in Texas A&M’s master’s in special education online must complete a thesis, the University of Washington’s online master’s in special education requires a capstone project. Master’s in special education online degrees offer students the chance to become knowledgeable and skilled educational practitioners by studying the latest industry research and trends. The following section takes a look at common classes within an online master’s degree in special education, though program details may vary by school. Adaptive Teaching Strategies for Learners with Mild to Severe Disabilities: After reviewing the characteristics of students with mild to severe learning disabilities, students delve into instructional strategies steeped in research and tested in classrooms. Specific topics include adapting coursework, creating inclusive environments, specific teaching modalities, and the use of developmentally appropriate student activities. Addressing Emotional and Social Needs: This course takes a look at students' behavioral, emotional, psychological, and social needs and how these affect their ability to complete traditional coursework. After learning to recognize the signs, teachers-in-training study tested and proven strategies to encourage appropriate behavior and minimize inappropriate actions. Using Technology to Support SPED Learners: This course helps special education teachers-in-training explore content delivery and learn how to incorporate adaptable and assistive technologies into learning plans. Many assistive technologies exist to help learners with specific disabilities, so this course both familiarizes degree seekers with those technologies and provides practical information on how to incorporate them into daily lesson plans. Special Education Licensure: In addition to standard teacher licensure, many states provide general special education licensure and/or disability-specific licensure, such as cognitive disabilities or behavioral disorders. Individual states oversee licensure requirements, so learners should check with their local board of education to learn about steps. Leadership in Special and Inclusive Education Certificate: The University of Kansas Online offers this postgraduate certificate for individuals looking to further hone their skills in championing special education learners' success — be they a teacher, administrator, principal, advocate, or other educational specialist. The programs can be completed from anywhere with an internet connection in six to eight months. Graduates of master’s in special education online programs use their degrees to enact change, support the needs of students, and ensure the special education learning community has the resources needed to thrive. In addition to working as classroom teachers, online master’s in special education alumni take up roles as educational diagnosticians, specialists, testers, and rehabilitation counselors. Special Education Teacher: Educators working in special education help children with cognitive, emotional, learning, mental, and physical disabilities reach their academic potential in traditional school subjects and basic skills. Those with an online special education master’s degree may oversee other teachers or serve as departmental chairs. Instructional Coordinator: Instructional Coordinators focused on special education students work to ensure instruction delivery methods and curricula reflect the unique needs of exceptional learners. They also work with other teachers and administrators to ensure their action plans carry out on a day-to-day basis and monitor for any needed changes. Instructional coordinators must hold at least a master’s degree. Elementary, Middle, and High School Principals: Serving as the ultimate decision makers, principals manage curricula, staffing, activities, and create conducive learning environments. Depending on the school, they may also set class schedules, evaluate teachers, meet with parents, and discipline students. Principal positions require a master’s degree. Enrolling in a properly accredited master’s in special education online program can mean the difference in whether or not teachers receive licensure, so it’s important to ensure your future college or university meets licensing standards. Two commonly seen types of accreditation are national and regional. Nationally accredited schools do not go through the same rigorous, multi-year process as regionally accredited institutions. Nationally accredited school attendees often struggle to secure financial aid, transfer to a different school, receive licensure, or even find a job. Seeking a school with regional accreditation ensures a smoother journey toward your education and career goals. Programmatic accreditation means that individual online master’s in special education programs receive accreditation rather than the school as a whole. For teachers, the golden standard for master’s in special education online accreditation is the Council for the Accreditation of Educator Preparation (CAEP). CAEP holds great respect from schools, employers, and licensing boards alike. Professional organizations provide many benefits to their members, including the opportunity to network with other like-minded professionals, access professional development and continuing education credits, receive information about emerging data and research, accept invitations to annual conferences and local events, solicit career coaching and support, and read news about new job openings in the field. The following section highlights a few organizations throughout America working to support special education professionals. National Association of Special Education Teachers: As the only national membership organization focused solely on SPED teachers, NASET provides professional development opportunities, continuing education, handouts, publications, events, national conferences, and career support. Learning Disabilities Association of America: LDAA offers helpful resources to members, including a special section devoted exclusively to educators. Here, teachers and other learning professionals can find research, publications, and information on specific learning disabilities. Council for Exceptional Children: In addition to providing opportunities for professional development, CEC offers local chapters with regular events, national conferences, a series of publications, and access to research for all its members.